Which are the best welding machines for your application? There are many types of welding machines but a straight forward way to select which welding machines are best. First you need to consider the types of welding machines that are available. The basic type is the oxy acetylene set, oxy welding equipment. This type of welding equipment is popular from the 1900′s onward where the mixture of oxygen and hydrogen was used in jewelry making. Today this technique is more advanced. These days a mixture of oxygen and acetylene is used that can produce a flame as hot as 3000 degrees Celcius. This equipment is not only used just for welding but also for bending straightening cutting and brazing as well. Oxyacetylene equipment is generally less expensive than most other welding equipment. It is also portable and very versatile but the bottle rental is a ripp off. As such it can be used for various welding purposes. However this equipment is not preferred for thick sections. It is best for thin metal sheets that can be cut or joined easily with this. There are different tips available with such equipment for different purposes. One can make use of the right tip and complete the work correctly and efficiently. This equipment can be used in almost any type of metals. Arc welding is also known as stick welding. This is the second type of welding equipment that we sell on our site. This welding requires a higher level of mastery of skill in welding. People who use this are highly skilled in many welding practices. This technique is best used on thicker and rougher surfaces. Most professional Welders use this technique. A flux coated stick electrode is used in this process. The flux melts away with the heat and liquefies to form a bond between the two metallic pieces. There are different types of metals that can be welded using this technique. This includes cast iron and stainless steel. There are certain preparations that you need to ensure before the welding process to ensure a smoother weld and a faster welding speed. You need thoroughly clean the area of welding and remove all foreign particles paint rust etc so that it does not react with the welding process. The weld will be complete with the slag that is formed from the flux that joins the two metal pieces together. You can purchase the best arc welding equipment on our website. We have been supplying arc welding equipment to professional welders for a number of years all over Australia and have received positive feedback about our products. When you purchase from us you can be sure that all your welding needs are well taken care of. We are sure that you will be quite impressed with the quality of the welding products that will take care of your welding needs. SPOT WELDER The very first piece of equipment required for any bodyshop is a spot welder. With the advent of the latest HSS (Boron, ZstE, bake-hardened dual phased etc), the spot welder must be an Inverter Welder. Non-inverter Welders will not do the job and therefore should not be considered. WHY INVERTER? The new HSS require a minimum 8,000amps (rms) of welding power through the complete welding cycle and this is only possible with inverter 1000hz to 2000hz mid-frequency welders. In addition to the power requirements, the clamping force at the tips of the twin sided gun must be in excess of 300daN (decanewtons) and in some cases as much as 450daN. This clamping force will hold the molten nugget in place during the weld and prevent it from sparking. Welders with less clamping force produce weak welds. A water-cooled welder that cools the cables, arms and tips is also highly recommended. Without water-cooling the cables and tips become very hot. The hotter the cables become the less efficient the welder becomes, producing poor welds into the bargain. Water-cooling ensures all welds are constant and 100 per cent correct. The InvertaSpot ATMw ensures all these requirements are met but in addition the water-cooling system is refrigerated which allows the welder to be used all day if necessary. Tig Welding Machines are best for neat penetrating welds. 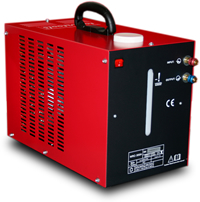 Tig welding machines use an electric arc to melt materials inside an inert gas shield. A tig filler rod or wire is often used to flow into the weld to build it up. These tig welders are also known as Gas Tungsten Arc Welders (GTAW) because they use a tungsten electrode to fire off the electric welding arc. But why do you need to use AC for Tig Welding of aluminium? In an ACDC Tig welding machine electrons need to flow welding work piece to welding tungsten in order to remove aluminium oxide. Excess workpiece to welding tungsten electron flow builds heat at the tungsten tip therefore alternating this process enables the oxide to be removed and heat to build at the job for penetration. A balance control can therefore give more cleaning or more job penetration by adjusting balance to be more positive or more negative. Mig welding machines are best for fast production welding. Mig welding machines use a wire that is short circuited causing it to melt. As the wire melts it forms part of the molten pool of metal that fuses the parts together. Mig welders are also known as Gas Metal Arc Welders (GMAW) because they also use gas to shield the arc but use metal for the electrode. The metal is on a spool called the mig wire.